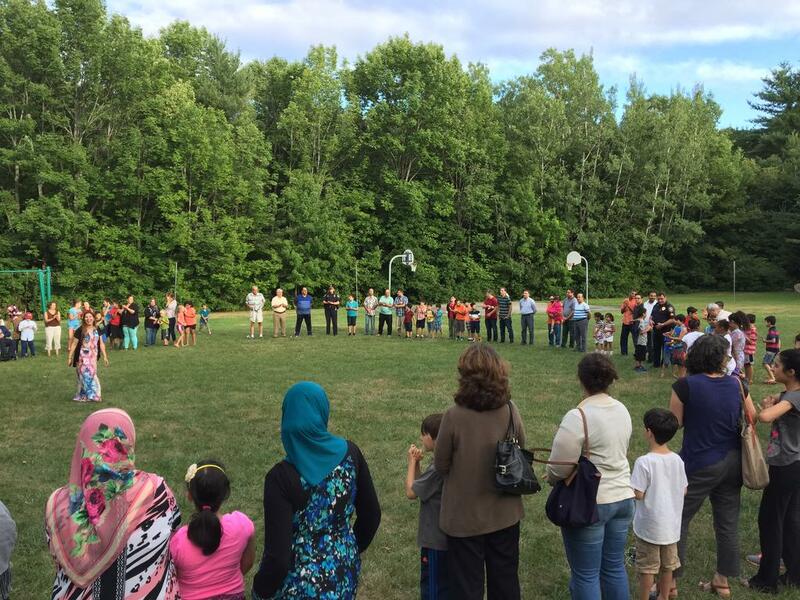 The community event, organized by the New England Arab American Organization and Westbrook Community Services, was meant as a gesture of solidarity between Westbrook and its Muslim community following threatening messages that were left at the complex last week. Westbrook police are still investigating the small, typed notes, which read “All Muslims are Terrorists should be Killed.” Four notes were discovered on the ground and stuck on cars Wednesday, Aug. 17, prompting fear among some Westbrook Pointe residents. Many are Iraqi immigrants, who a day later, were invited to a meeting with police officials. Police Chief Janine Roberts, who along with other officers, joined the circle Monday, said there is no update in the investigation. The threats are assumed to be in reaction to news reports about Adnan Fazeli, a Maine refugee who was radicalized and died fighting for the Islamic State in Lebanon. The reports said Fazeli lived at Westbrook Pointe for a brief time. Sahloul, who immigrated from Lebanon in the late 90s, said she started the organization as a bridge between the two cultures. She said newcomers often feel isolated. The organization has an enrollment of 56 people so far. During the event Monday, a large ribbon was attached to nearby trees, and guests were invited to write thoughts or prayers on butterfly-shaped pieces of paper. Resident Kathleen O’Neill-Lussier said she’s recently started a grant-funded Westbrook program called Neighbor to Neighbor, which has similar goals of the Arab American Organization. “The goal is to help people who are new here connect with the neighborhoods and resources,” she said. Dozens of children rode bicycles, played basketball or ran in the fields during the event Monday. Many weren’t shy about their backgrounds. Three boys, ranging in age from 7-10, said they have lived in Westbrook since they came from Iraq when they were toddlers. They attend Saccarappa Elementary School and Westbrook Middle School. One said he was excited that the city is rebuilding the school to make it bigger. For the adult residents, however, the recent threats were reminders of the reasons they left their countries in the first place. Ramzi Al-Qayyar, an Iraqi resident of Westbrook Pointe, said during the event that he’s lived in Westbrook for 3½ years and loves Maine and the American culture. He said Muslims are a peaceful people. “We exclude these people from humanity,” he said, referring to radicals who promote violence. Al-Qayyar said he’d also like to see the Iraqi and other Muslim residents get more involved in the community. Many people during the event had never met, and were introducing themselves. Sahloul said an ice cream truck was set to make an appearance at 6 p.m., handing out free samples. She said some of the neighborhood children have grown afraid of going too far from the neighborhood. Mayor Colleen Hilton, who also attended the event, said she had a lot of conversations with Westbrook Pointe residents. “I think they just appreciate the turnout and support,” she said of the event. Promptly at 6 p.m., the music from the ice cream truck could be heard rounding the corner from Prospect Street. As quickly as the large circle in the field had come together, it broke apart, and a new line formed for ice cream. A circle formed Monday at the Westbrook Pointe apartments was organized as a symbol of support for the city’s Muslim community following threats left at the complex last week. Guests at a community event supporting Westbrook’s Muslim community wrote messages to hang along a line of trees.